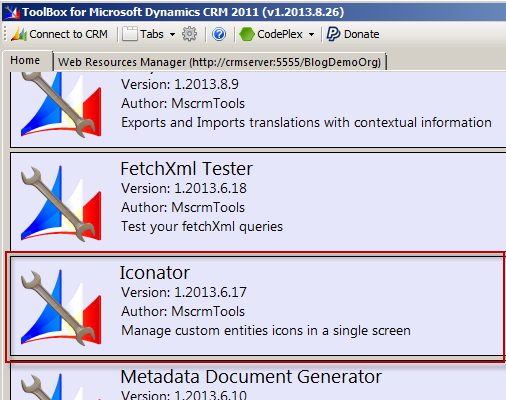 First, get your hands on the XRM Toolbox (which now supports CRM 2013 as well). 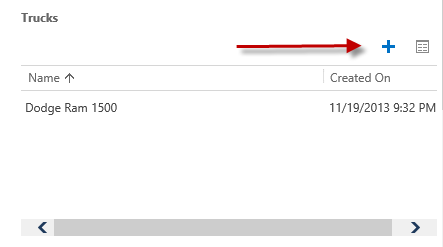 (note: if you don’t see the apps listed on the home screen like they are in the screenshot above you will need to go back to the program folder and right-click on each DLL and unblock each file). 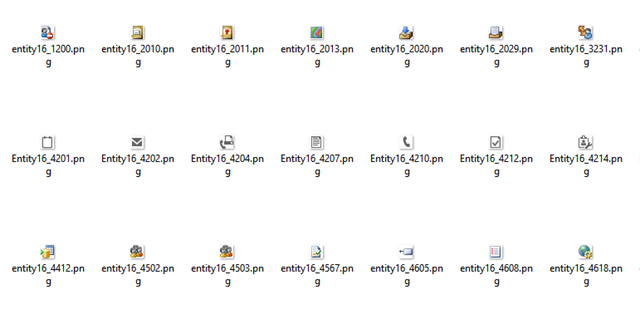 Ok, so first step is to upload some icons. Cool, that’s all my Web Resources created. 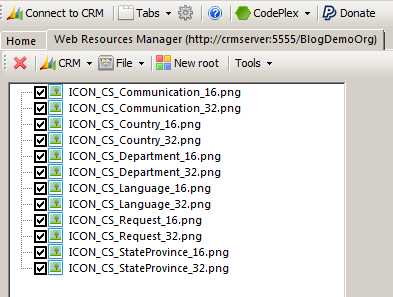 Now, to apply them to my custom entities I launch XRM Toolbox’s ICONATOR !!! This is pretty quick stuff. 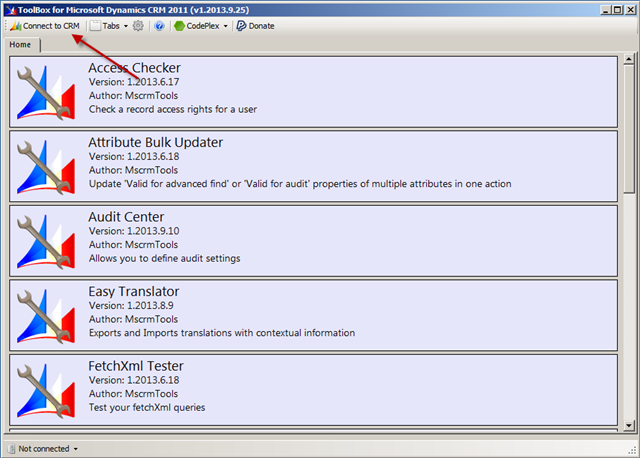 XRM Toolbox is a great tool. 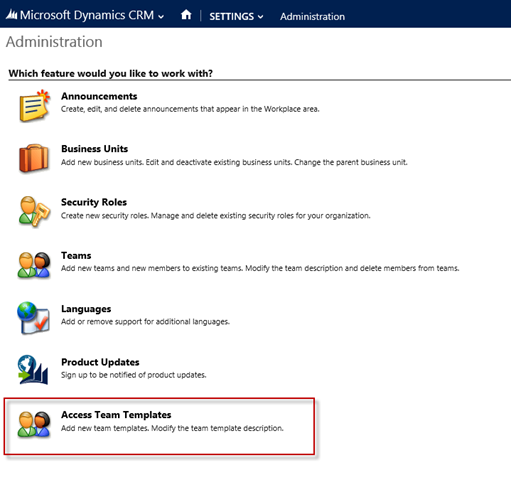 This entry was posted in Uncategorized and tagged crm, icons on November 25, 2013 by Gareth Tucker. 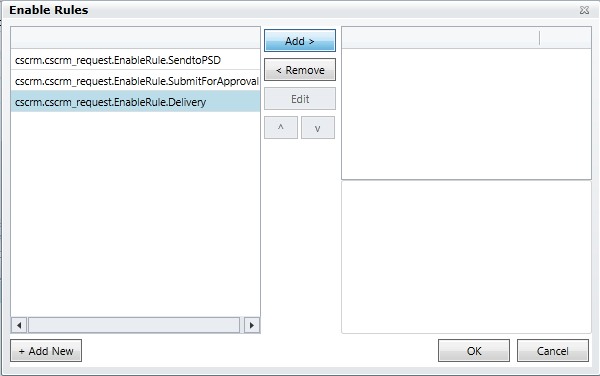 Today I had to dynamically disable a custom Ribbon button. 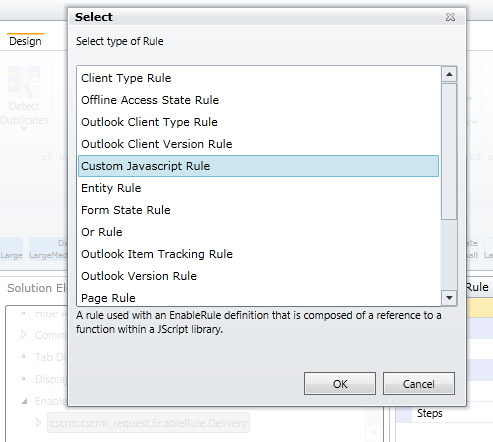 My rule needed to be based on fields on the form and based on the form mode. 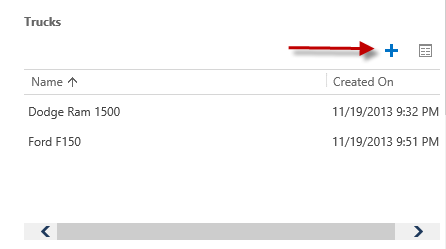 I only want the button enabled on the Update form and only when a certain checkbox is checked. Here’s the steps. 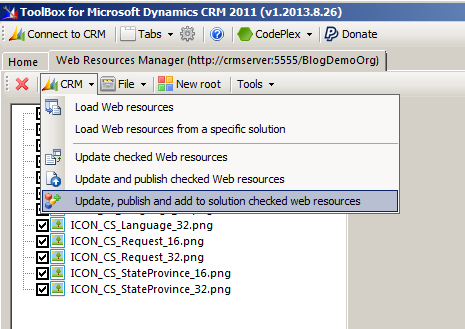 These will work for CRM 2011 Ribbon buttons or CRM 2012 Command Bar buttons. You add custom ribbon buttons by dragging a “Button” from the Toolbox in the bottom left corner of the screen up into the ribbon. Then you set the Button properties through the Property window on the right and define the Button’s Command through the Solution Elements tab in the bottom middle of the screen. 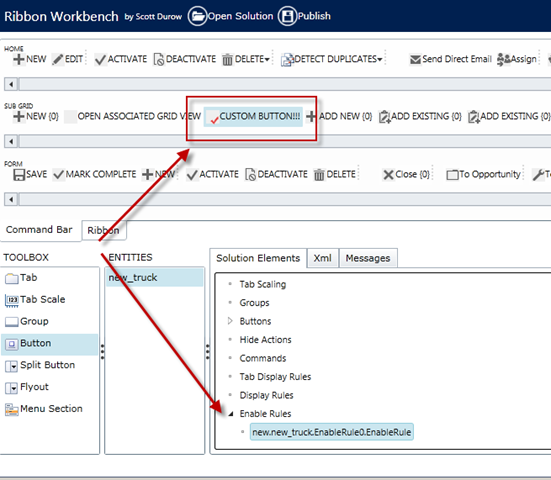 If you didn’t have a Command defined for your Button you would need to right-click on Commands in the Solution Elements tab and select Add New and then add the Enable Rule. 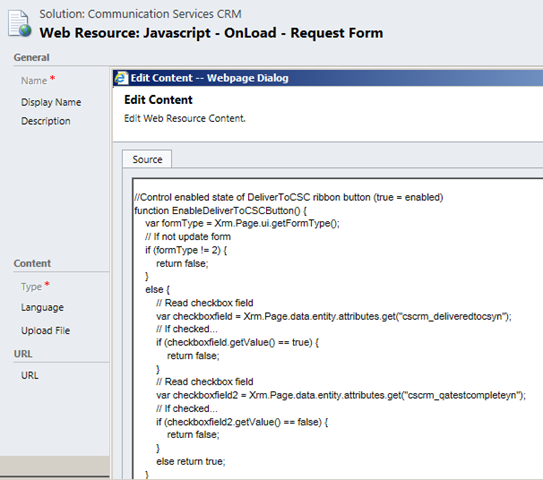 And you would need to select the Command you created back in the Button’s properties. And that’s it. The approach for dynamically changing the display state of a button is almost identical so you are not an expert in that too. 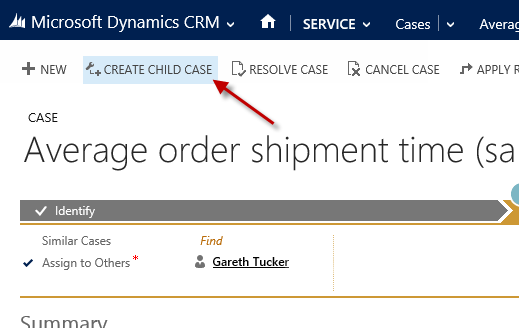 This entry was posted in Uncategorized and tagged CRM 2011, CRM 2013, ribbon on November 25, 2013 by Gareth Tucker. 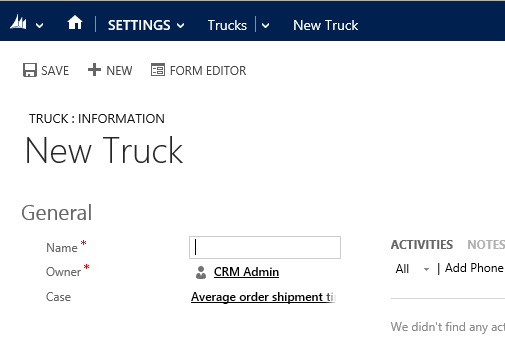 The latest release of Microsoft Dynamics CRM comes with a new security model approach for us to consider. 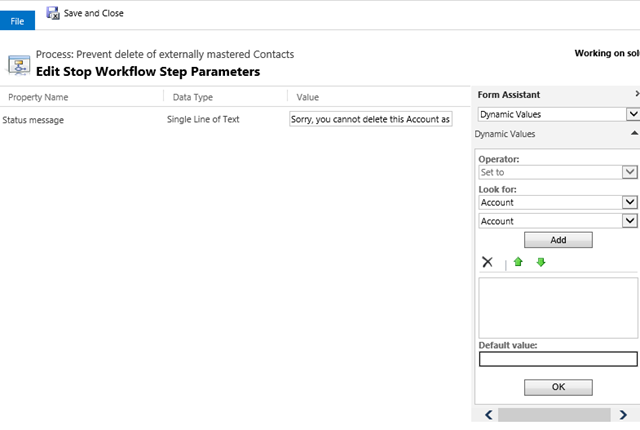 The new “Access Teams” functionality in CRM 2013 suits scenarios where data access rules cannot be easily determined upfront but rather need to be set ‘on the fly’ on a record by record basis. The common example is where an organization assembles a unique group on individuals for each sales pursuit or to manage each customer. And that’s it, that’s all you need to do as an end user. Whoever you select will immediately be granted access to the record and (potentially) to its child records. How is this achieved? 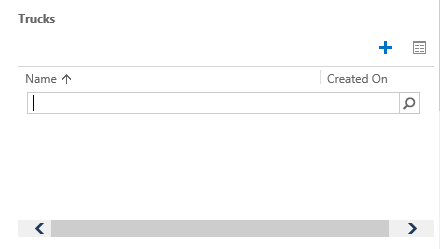 Well, behind the scenes as soon as you add someone via this sub-grid CRM will create an Access Team, add the user to the Team and then share the record to the Team. 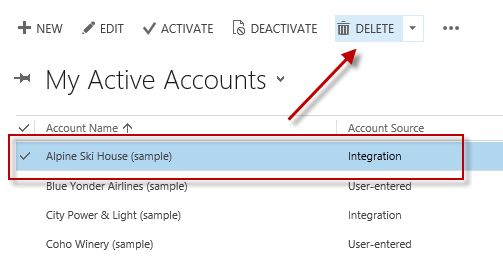 So there is not a lot of new magic here, this is just Team-sharing automation, but now available out of the box. 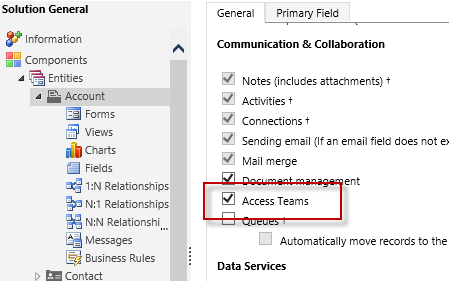 Do note though, these new Access Teams are treated a little differently from the traditional Teams we know and love in CRM. 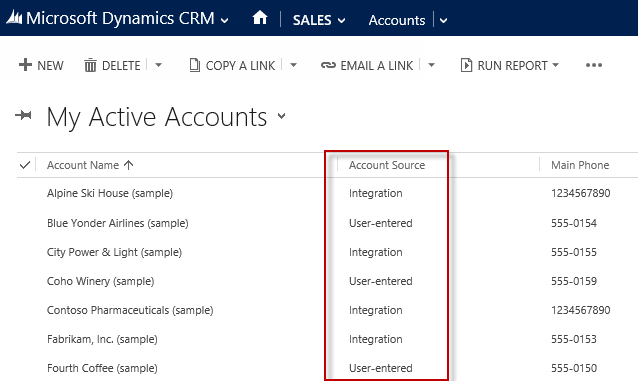 They are stored in the same entity but CRM treats them differently to optimize performance (note: CRM filter Access Teams out of views by default, you have to use Advanced find to see them, they will stand out when you do see them as they are named with a GUID). 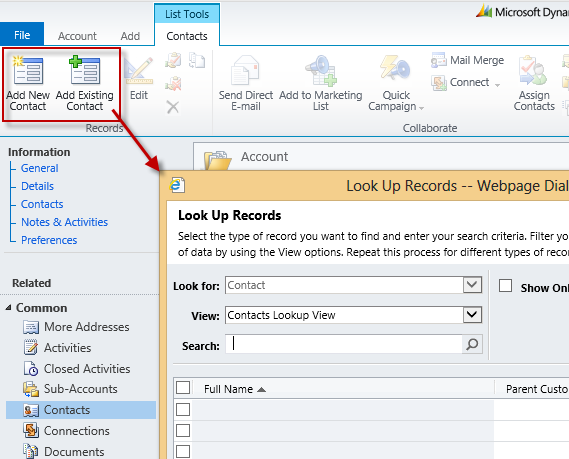 Traditional record-owning Teams are cached by CRM and when you have users belonging to a large number of Teams you can suffer from performance problems. 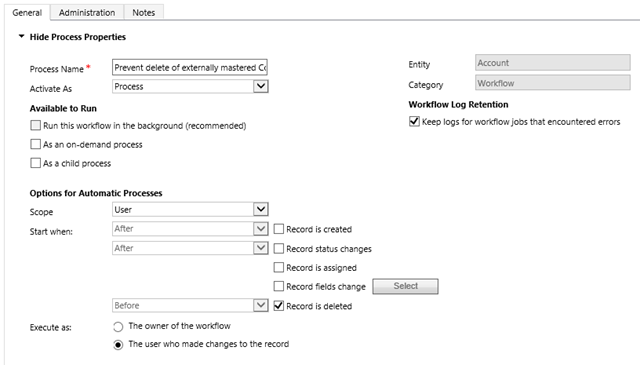 These new Access Teams are not cached and that avoids this performance limitation. 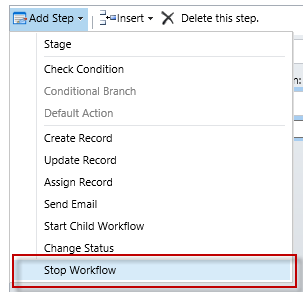 However, because behind the scenes this functionality is using Sharing you are vulnerable to the performance issues associated with blowing out the Principal Object Access (POA) table. Make sure you read this whitepaper a few times. You also need to consider child records and whether the share will cascade or not (more detail here). Not cascading will result in records not being visible, cascading will result in more POA records. 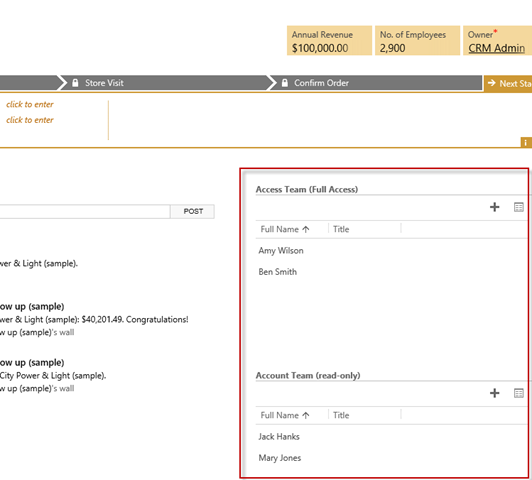 Users can create a Team, add members to the Team and assign the Team as the owner of the record. Setting this up each time is a clunky user experience. You lose the distinction of a primary owner and this will result in poor performance once a user belongs to too many teams. On the plus side there is minimal POA impact. 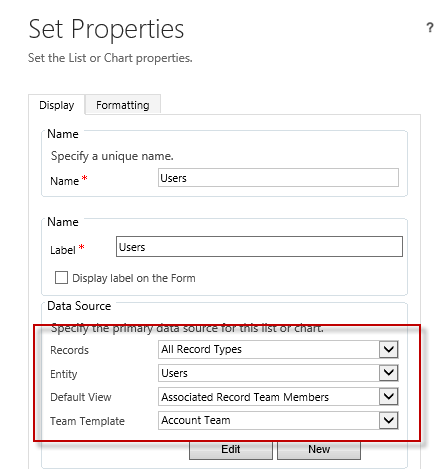 Do consider though, do you still want a specific individual identified as the Owner of the record (perhaps with additional permissions) or is it ok to just have a Team specified? 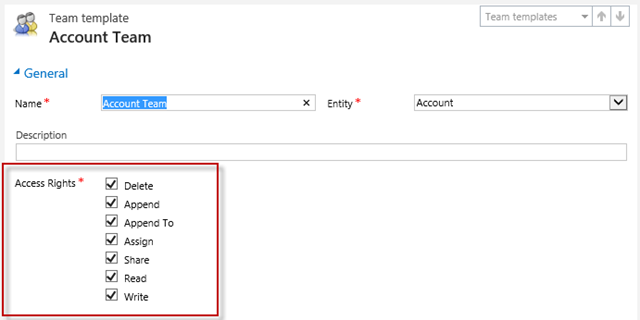 You could always put a custom User lookup field on the form if calling out an individual owner was important. Alternatively, you could stick with one record owner and have users manually Share to grant permissions out to individuals. 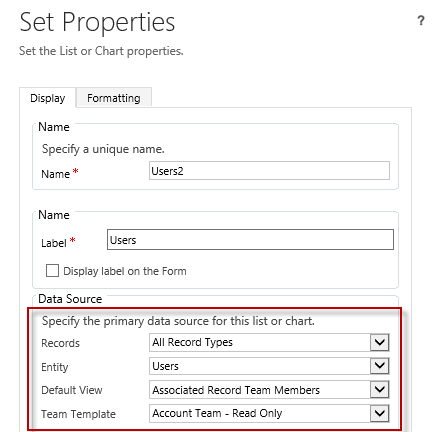 Again the user experience with setting this up each time is clunky and with this approach you can also hit performance problems if dealing with larger volumes due to the number of sharing records generated in the POA table. I have found that if you set these wrong initially the sub-grid breaks and correcting the values doesn’t solve the problem, you need to recreate the sub-grid. So, is this is a good feature? Should you use it? If you aren’t dealing with large record volumes (e.g. 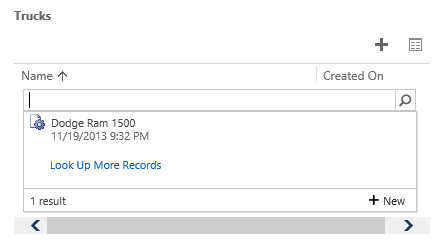 hundreds of thousands or millions of records) then sure, consider it, but test the cascading behavior carefully to make sure team members get all the access to child records you expect. Look out especially for non-parental relationships, they may give you grief. If you are dealing with large record volumes you need to use this approach with caution, just like you do when considering any large scale use of Teams and/or Sharing. Microsoft have done their best to mitigate performance issues with this approach but its still vulnerable to POA explosion. Your life is going to be a lot easier if you can get by with a Business Unit security model. If it was my choice and I was not influenced by regulatory requirements a Business Units design would always be my approach. 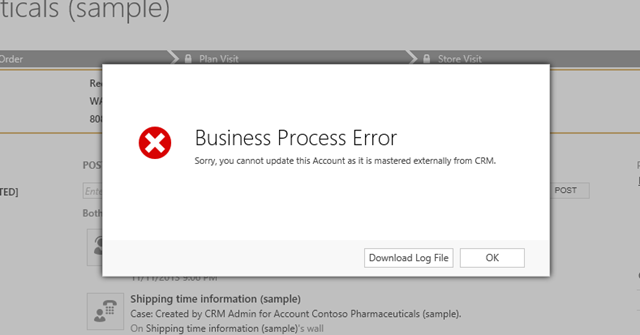 Too often CRM customers have an unjustified need to lock down data access and it just causes unnecessary problems. So if you are a customer, re-think your requirements. If you are a Consultant, push back, test the requirement. 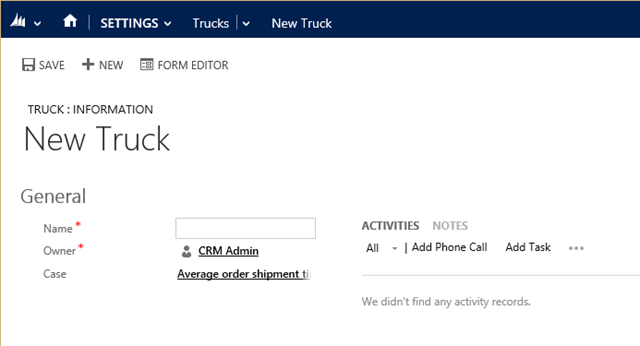 This entry was posted in Uncategorized and tagged Access Teams, CRM 2013 on November 24, 2013 by Gareth Tucker.